It's simple to wipe clean inside and out. 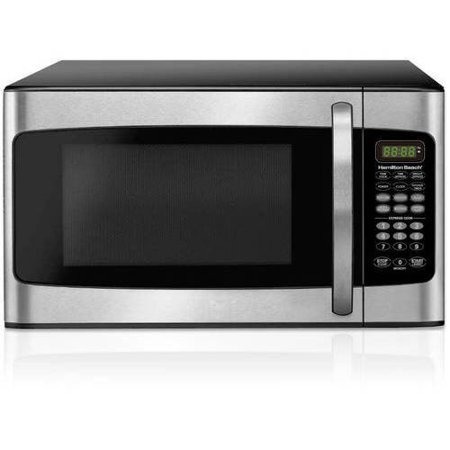 This Hamilton Beach 1.1 cu ft 1000-Watt Microwave takes up little counter space and will match most kitchen decor. No more waiting for frozen food to defrost when you use this Hamilton Beach 1.1 cu ft 1000-Watt Microwave. Ideal for busy families, it heats up and defrosts your favorite frozen food quickly. It has an output of 1000 watts and 10 power levels to heat up a wide range of foods to the required temperature. This white microwave oven includes a lock out feature for child safety. The front panel includes an easy-to-read LED display with touch pad buttons and six pre-set buttons. Choose between popcorn, potato, pizza, frozen vegetable, beverage and dinner plate at the touch of a button. It also includes a kitchen clock and timer function. The easy-to-read buttons allow you to select the ideal power level and defrost food by time or weight. You can also set the memory for quick heating of items you use the most. 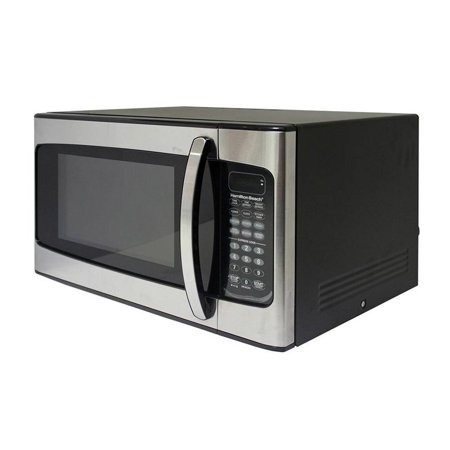 The Hamilton Beach microwave has a black casing with stainless steel or red inset. The white inside includes a turn table plate to allow for even heating for your food items.